Almost 50 years after Bruce Lee said studio executives wouldn't make his TV show pitch, which he attributed in part to their unwillingness to cast an Asian lead, Cinemax is bringing the legendary martial artist's project to life. Lee's original pitch, "The Warrior," featured a Chinese martial artist exploring the American West. In 1972, about a year after the studios to whom Lee brought the project declined to make the show, "Kung Fu" starring David Carradine as a martial artist exploring the American West began to air. Filmmaker Justin Lin ("The Fast and the Furious: Tokyo Drift," "Star Trek Beyond") remembers watching "Kung Fu" as an 8-year-old new immigrant from Taiwan and being confused. The story of Lee's efforts to make "The Warrior," which came from an interview aired on Canadian television that he did in the 1970s, also stayed with Lin. The pursuit of Lee's project led Lin in 2014 to meet with Shannon Lee, the actor's daughter and the steward of his notes and papers. "The Warrior" existed: The documents sat in a box in Shannon Lee’s office, and she showed it to Lin. That meeting ultimately led to the development of “Warrior,” a TV series scheduled to premiere on Cinemax on April 5. 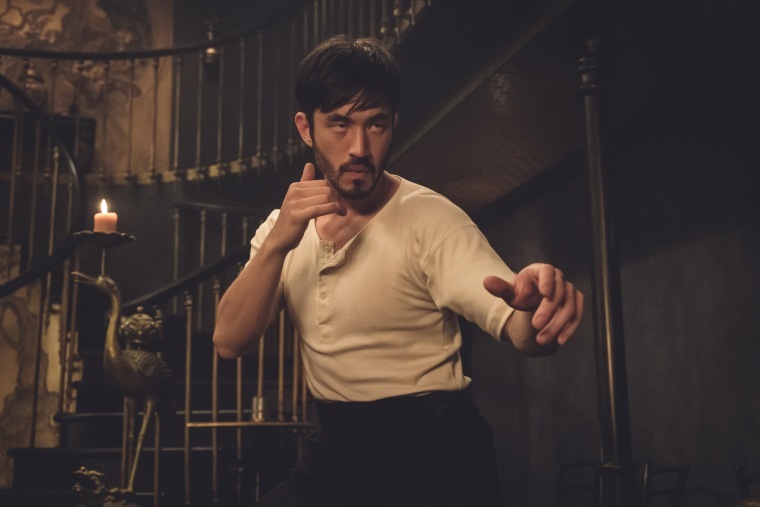 The show follows martial arts prodigy Ah Sahm (played by Andrew Koji) as he travels to San Francisco in search of a woman the audience has yet to meet. There, Sahm gets caught up in a conflict between rival Chinatown gangs. “I felt like there was an opportunity to correct a wrong, to really try to honor what he was trying to do,” Lin, an executive producer of the show, said referring to Bruce Lee. In addition to the central storyline, “Warrior” explores the post-Civil War West in the years before the passage of the 1882 Chinese Exclusion Act. Early episodes touch on rising tensions among Irish laborers, anti-immigrant sentiment targeted at the Chinese, and politics and business in a growing San Francisco, among other topics. Chinese history in the United States — from the gold rush to work on the transcontinental railroad — regularly appear, in part in an effort to introduce viewers to a period of history that the filmmakers said is rarely represented, even in schools. To construct the setting for the show, executive producer and writer Jonathan Tropper said he did much of his own research to learn about aspects of history he hadn't gleaned from school, such as the ways U.S. companies recruited in China and the dangerous and difficult conditions that Chinese laborers experienced. “It was about a time in history I didn’t really know about,” Tropper said. The production team also made an effort to ensure that the show featured Asian Americans both behind and in front of the camera. According to Tropper, two members of the writers room are Asian American. Of the first nine episodes, two credit an Asian-American writer and three credit Asian-American directors. The way the Chinese characters speak is also intended to have the audience identify with them. While the show’s politicians and Irish characters speak period-appropriate English, the Chinese characters — who canonically speak Cantonese to each other — have a modern English vocabulary when on screen. Though the show touches on several modern themes, Shannon Lee said the decision to explore these ideas was her father's. Bruce Lee’s original treatment was updated for modern TV-making, with a grittier, more stylized and comic book-like feel, Lin said. As for the setting, Bruce Lee liked to explore different Chinese experiences in his work, his daughter noted. Bruce Lee's “The Warrior” was set in San Francisco due to his interest in the early Chinese immigrant experience. That is something Shannon Lee has worked to preserve as CEO of both the entertainment company and a nonprofit foundation that bears her father’s name. It has been difficult on occasion, she acknowledged, as some people have different emotional connections to her father than she does. For instance, Bruce Lee recently appeared as a character in the trailer for the upcoming Quentin Tarantino film, “Once Upon a Time in Hollywood.” Shannon Lee said her family was not contacted about the portrayal, and she has concerns about whether her father will be depicted as a whole human or as a caricature. But over time, she has learned to focus on her father’s legacy and philosophies, both which are represented in "Warrior," primarily through the development of the main character, Ah Sahm.